Mexican American children -- Fiction. New Mexico -- Fiction. Healers. Mexican American children. Mexican Americans. New Mexico. 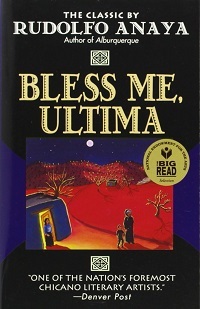 Bless Me, Ultima is Rudolfo Anaya's first novel, written around 1970 and published in 1972. It is the semiautobiographical story of a young boy’s coming-of-age within a cultural tapestry that includes Spanish, Mexican, and Native American influences. Set in the small town of Guadalupe, New Mexico just after World War II, Antonio Márez y Luna (Tony) tells his story from the memories of his adult self, who reflects on his growing up. The novel opens as the protagonist, Antonio, approaches the age of seven when his family decides to house Ultima, an elderly curandera. Ultima, known as “La Grande” in the Márez household, embodies the wisdom of her ancestors and carries the powers to heal, to confront evil, knowledge of how to use the power of nature and the ability to understand the relationship between the living and the spirits. Following an immediate bond with Ultima, Antonio learns of the many herbs and barks, which she uses in her ceremonies.Tony's progress in learning about life is grounded in Ultima, who is highly respected by his parents. However, one night Antonio witnesses the death of a man back from the war, which makes him question his religion and identity, and sparks his journey towards manhood. At the conclusion of the novel, Antonio reflects on the tension that he feels as he is pulled between his father's free, open landscape of the llano, and his mother's circumscribed river valley of the town. In addition, he reflects on the pull between Catholicism and the continuation of Ultima's spiritual legacy and concludes that he does not need to choose one over the other, but can bring both together to form a new identity and a new religion that is made up of both. Antonio says to his father: "Take the llano and the river valley, the moon and the sea, God and the golden carp—and make something new... Papa, can a new religion be made?" -- Wikipedia contributors, "Bless Me, Ultima," Wikipedia, The Free Encyclopedia, https://en.wikipedia.org/w/index.php?title=Bless_Me,_Ultima&oldid=776296976 (accessed May 1, 2017).